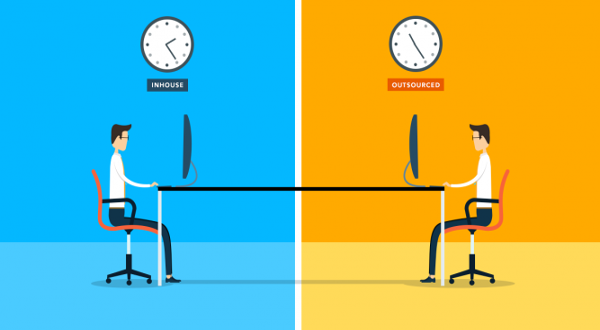 4 Pros and Cons of Hiring In-House Vs. Outsourcing! There comes a time when a company has to fill the talent void with skills that have been lost or have to be acquired to keep the company afloat and up to speed with new technology and such. As a result, companies look to compensate this gap by two hiring methods: outsourcing and insourcing. Outsourcing is when employers look for help outside of their office walls, which is searching for a professional that has the skills they require. Insourcing is hiring an external workforce to accomplish a specific type of job. However, both forms of hiring have their share of pros and cons. It saves you up on time and allows you to focus on your work. Since you need not bother in training them about what they need to be doing, you can rest at ease. It takes even less time to find talent thanks to agencies such as Freelancer and Upwork. Projects will be completed quicker and even reach the market faster. Outsourcing is preferred for the completion of short-term projects, as in talent is needed specifically for getting a one-off project done. Guaranteed continuation and no down time. Unless you are working with a fresh or small company, there is absolutely no chance of a sick leave, vacation break, or looking for placement on long service leave. Your intellectual property may be at risk of being exposed. Thus, it should fall upon you to gather some useful insights about the talents you take onboard. Use social media platforms such as Facebook and LinkedIn to help you gather those insights. Good service providers tend to be very busy. Once a freelancer’s brand and market grow as the days go by, it can be really difficult to get a hold of them or know when they’ll be free. Be wary of the fake freelance profiles. These people commit greatly to forgery in order to conceal their true selves. It is essential that you check through social media channels and review/ratingsystems. Communication gaps are likely. You should know that some freelancers work in different time zones and have different types of schedules. You can have face-to-face conversations with talent. It offers more engagement between employees working on the same project, which in turn enhances progress. It is less expensive. As you already know these employees, they already know of the work environment and the ethics of the office. Knowledge and skills developed by working on your projects are kept in-house and can be available for later use. You can offer salary and a room to grow, which makes in-house hires less of a flight risk. Finding top talent can be a challenge, especially in smaller local areas. Chances are that most of the talent may already be employed. Internal staff may not be skilled or confident in the recruitment process. Having to move from one area to another can pose such a risk. It can be time-consuming considering how you are taking your own employees away from the posts that they’re most comfortable with. Top employees may expect medical and dental benefits, and also a 401(k) plan match. Just bear in mind that these prices are considerably higher compared to what you offer to a freelancer. Eileen Burton works as an HR manager for Assignment Valley. Apart from hiring & recruitment affairs, she is responsible for revising HR policies. In addition, she works as a part-time academic writer and provides uk assignment help to students.